Exposing an Anti-Gunner’s hypocrisy is necessary. I talk to Anti-Gunners all the time. Some of them are people I know and some of them are informants, they just don’t know it at the time. I was talking to an Anti-Gunner during a business gathering. She was approximately 35-40 years old and extremely adamant about her views on guns. She was convinced that guns were the cause of all that is wrong with this Country and she didn’t want to hear anything to the contrary. She did feel very entitled to let me know what she thought, and made sure she took the opportunity to give me a piece of her mind. Eileen Left: I know you’re the guy who wrote that gun book but I have no tolerance for anything that puts people in danger. DW: I agree with you. I don’t like when people are in danger either but what exactly are you referring to? Eileen Left: I just think it is misleading to encourage people to think everyone should own guns when they are so dangerous. DW: OK? Are you implying that I am encouraging everyone to own guns? Eileen Left: Well, when you write a book about guns and promote such a dangerous thing like that, then yes. DW: Ma’am, have you even read my book? Eileen Left: I don’t have to. DW: I get it. You already know what’s in it. That’s ok, let me ask you something. How do you know that it’s the gun that is dangerous? Eileen Left: Are you kidding me? Look around. There are guns everywhere. All you have to do is turn on the news and there is a shooting somewhere. DW: If by “everywhere,” you mean Gun-Free Zones, then you would be somewhat accurate because 70% of mass killings are committed in areas where good people have been rendered unarmed and defenseless by laws that you support. Eileen Left: What I do know is, we need to stop this gun-violence. 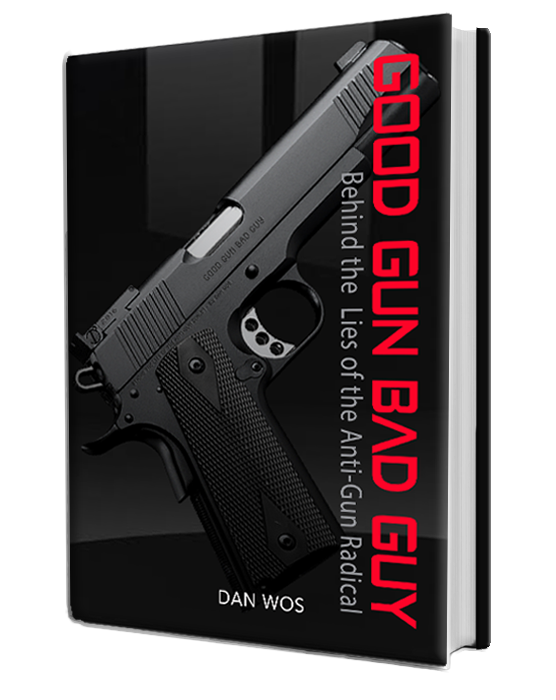 DW: I find it curious that you would use the term “gun-violence.” Have you considered the reality that maybe what we are dealing with is “human-violence” and you are perpetrating a lie that takes the bad guy off the hook? Eileen Left: Without guns, we wouldn’t have the problem. We need to do something about this gun violence and get these guns off the streets! We all need to do our part. DW: Just so you know, we gun owners are doing everything we can to stop human violence. As a matter of fact, Pro-Gunners have shown up in huge numbers to get their concealed-carry permits so we can protect ourselves, our families and even you. Eileen Left: Oh great. Don’t do me any favors by protecting me. I’m fine. That’s all we need, more guns! DW: Guns in the right hands, yes. Now we need you Anti-Gunners and liberal-progressives to do your part and stop voting for politicians that support open borders, limited vetting and sanctuary cities. We also need you to stop supporting Gun-Free Zones where innocent people are getting slaughtered. Yes, schools being one of them, where the lives of five, six, and seven year old children are ended because the laws you support deny them the safety they need. What do you think those little kids were thinking as they watched their classmates get killed right next to them? Do you think, in their last moments, they agreed with your idiotic notion that making them helpless is a good thing? Do you think the parents of those children would have a different opinion after burying their child? The next time you open your mouth about the dangers of guns, ask yourself how badly those little kids would have wanted a good guy with a gun to protect them. Ask yourself how those innocent little children would feel knowing that people like you made it impossible for them to even have a fighting chance. What would they think if they knew what was really going on? What would they think if they found out that they were put in a helpless situation because of your fear of guns? We are doing our part. Why aren’t you? Eileen Left: I don’t have time for this.